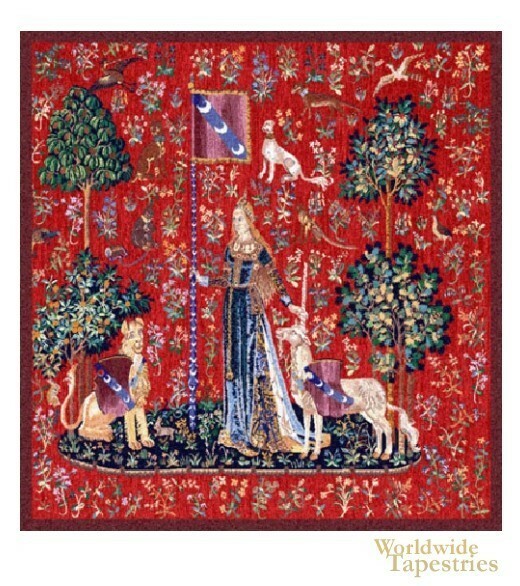 This Le Toucher tapestry shows one of the tapestries in the series of Lady and the Unicorn tapestries, the original of which is in the Musee du Moyen-Age museum. It represents the sense of touch, as the lady is touching the unicorn's healing horn as well as the pennant of Jean le Viste. These tapestries were rediscovered in the 19th century, though before they were brought to public attention by novelist George Sand. This unicorn tapestry Le Toucher Fonce is backed with lining and tunnel for easy hanging. Dimensions: W 32" x H 33"